From the ancient ruins of a first-century estate, Jeff explores the prophetic position of Jesus as the Deliverer. At this location, we learn that God sent the Messiah to set the captives free and heal the brokenhearted. We also discover the Hebrew meaning behind the Lord’s Prayer, and enjoy an enlightening interview with Zola and Ra'anan Gissin, the former Chief Advisor to Ariel Sharon. The Gospel of Isaiah, written 700 years before Christ, reveals the Jewish nature of our Messiah and the fulfillment of His coming as the Lamb of God. 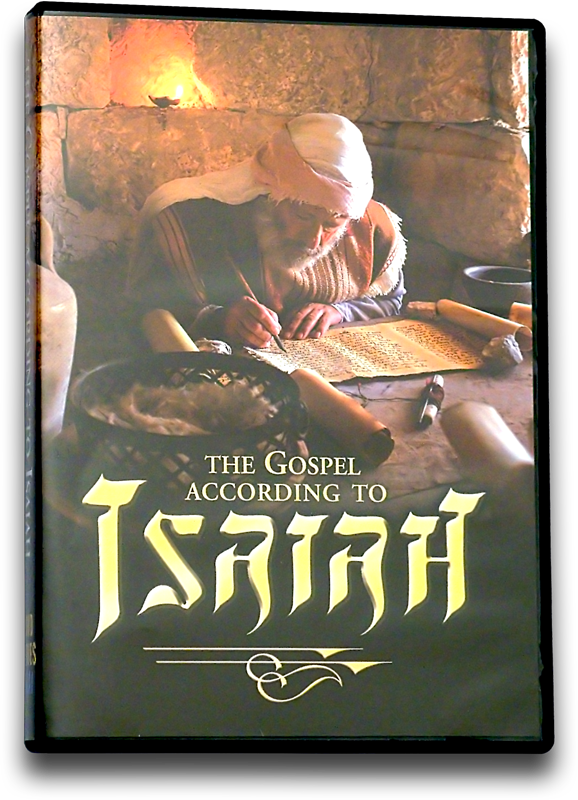 See why New Testament authors have quoted Isaiah more than any other Old Testament source and why this Old Testament narrative is often called the 5th Gospel. 00:47 A HEARTY SHALOM TO ALL OF YOU. 00:49 JEFFREY SEIF HERE WITH MY GOOD FRIEND SANDRA LEVITT. 00:52 SHALOM JEFF. HOW ARE YOU DOING? 00:53 AND ON THE MENU TODAY WE'RE LOOKING AT ISAIAH. 01:02 THAT GOD DOES IN OUR LIVES? 01:04 AND THAT'S THE STORY ON THE MENU FOR TODAY. 01:08 WE'RE GOING TO SHOW YOU A DRAMA. WE'RE GOING TO SHOW YOU A TEXT. 01:11 IT'S ALL ABOUT HOW GOD CAN RAISE US UP FROM A RUINED ESTATE. 01:33 "THE SPIRIT OF THE LORD IS UPON YOU,"
01:35 "BECAUSE THE LORD HATH ANOINTED YOU TO PREACH GOOD TIDINGS UNTO THE MEEK." 01:40 "HE HATH SENT THEE TO BIND UP THE BROKEN ONE." 01:43 "TO PROCLAIM LIBERTY TO THE CAPTIVES." 01:46 "AND THE OPENING OF THE PRISON TO THEM THAT ARE BOUND." 01:49 "TO GIVE UNT0 THEM BEAUTY FOR ASHES, THE GARMENT OF PRAISE FOR THE SPIRIT OF HEAVINESS." 02:07 WHEN THEY ARE SCURRYING FOR PLACES TO HIDE, KNOWING THAT THEIR LIVES HUNG IN THE BALANCE. 02:24 TO HIDE AND HOPE THAT THE WHOLE THING WOULD PASS THEM. 02:30 BUT I DOUBT THERE WERE MANY SURVIVORS IN THIS HOUSE. 02:35 THIS WAS A FINE HOUSE RIGHT UP CLOSE TO THE "BEIT HA-MIKDASH". 02:52 AND I KNOW THEY WERE TORAH OBSERVANT TOO. 02:55 THERE'S "MIKVAOT", RITUAL BATHS, ALL OVER THE PLACE. 03:06 AND I'M SURE THOSE WHO LIVED HERE COUNTED THEMSELVES FORTUNATE. 03:11 THAT IS UNTIL THE WORLD WENT SOUR. 03:15 UNTIL IT ALL TURNED UPSIDE DOWN AND WHAT WAS A HOME OF SONG AND JOY BECAME A HOUSE OF TERROR. 03:24 MANY DIED, MOST, IF NOT ALL. 03:35 TO BE CARTED OFF INTO SLAVERY IN A FOREIGN LAND. 03:40 AND THAT'S WHAT HAPPENED TO THE FORTUNATE. 03:43 WELL SO MUCH FOR THE BAD NEWS. 03:46 STANDING HERE ON THIS RUIN, PEOPLE DON'T WALK HERE ANYMORE, THEY'RE NOT ALLOWED TO. 03:53 WE HAD TO SECURE PERMISSION FOR ME JUST TO COME AND STAND ON THESE STONES. 04:04 INTERRUPTED BY THE SAD STATE OF AFFAIRS THAT I JUST DESCRIBED. WELL SO MUCH FOR THE BAD NEWS. 04:14 ...IF WE CAN FIND GOOD NEWS OUT OF THIS RUIN. 04:24 THERE WAS A PROPHET ISAIAH, THE GREATEST PROPHET IN OLD TESTAMENT HISTORY. 04:42 WE HAVE BEEN DESCRIBING SOME OF THE CHARACTERISTICS OF THIS MESSIAH. 05:07 "WHAT ARE THE PURPOSES FOR THIS PERSON, FOR THIS DELIVERER?" 06:23 AND DON'T WE WANT THE GOOD LORD SINGING OVER US LIKE THAT? 06:28 SOMETIMES LIFE CAN BE SO HARD. WE'RE BETRAYED BY PEOPLE, IF NOT DISAPPOINTED. 06:36 WE'RE BETRAYED BY CIRCUMSTANCES. 06:43 WE'RE BETRAYED BY CLOSE FRIENDS AND ASSOCIATES. SOMETIMES THE WORLD CAN TURN UPSIDE DOWN. 07:33 PREDICTED IS THAT THE MESSIAH IS GOING TO COME TO ACCOMPLISH A GOOD PURPOSE. 07:40 AND WHAT'S THAT PURPOSE? 07:42 WELL ISAIAH GOES ON TO DESCRIBE THAT THE SPIRIT OF THE LORD IS UPON THIS MESSIAH. 07:46 AND WHAT DOES HE DO? 07:52 WHO FEEL THAT LIFE HAS SET THEM IN A PLACE OF DISFAVOR. 07:58 THAT'S WHY THE GOSPEL IS CALLED "GOOD NEWS". 08:15 AND EXPERIENCE NEW CIRCUMSTANCES IN CONJUNCTION WITH THAT NEW LIFE. 08:36 ASK FOR OUR FREE MONTHLY NEWSLETTER, THE LEVITT LETTER. 08:42 WITH THE LATEST VIDEOS, BOOKS AND MUSIC. 08:56 GREECE OR THE HOLY LAND EXPERIENCE THEME PARK IN ORLANDO, FLORIDA. 09:00 PLEASE CONTACT US FOR MORE INFORMATION. 09:09 WHAT WOULD THEY SAY? 09:12 WOULD THIS ONE SAY... "AH, ONCE UPON A TIME KING HEROD LEANED AGAINST ME." 09:19 WOULD THIS STEP SAY... "AH, ONCE UPON A TIME PONTIUS PILOT WALKED ON ME." 09:26 WOULD THIS ONE SAY... "AH, I GOT YOU BEAT." 09:29 "ONCE THE SHADOW OF JESUS HIMSELF WAS CAST AGAINST ME." 09:35 WOULD THEY ALL SAY... "AH, BUT LISTEN TO ME AS WELL,"
09:38 "THAT MANY YEARS BEFORE JESUS, THE PROPHET ISAIAH WALKED AMONGST US,"
09:45 "AND HIS SHADOW AND HIS FOOTPRINT IS FOUND ALL OVER THESE ROCKS." 09:49 YOU KNOW THEY'RE ALL RIGHT. 09:52 WE'RE IN THE CITY OF JERUSALEM NOT FAR FROM WHERE THE TEMPLE MOUNT WAS. 09:57 THIS IS THE NEIGHBORHOOD WHERE THE JEWISH ELITE RESIDED. 10:01 ISAIAH HIMSELF WAS CUT FROM ROYAL CLOTH AND SO HE WOULD HAVE ENJOYED THIS LIFE OR A SEASON. 10:09 ISAIAH FOR HIS PART GAVE UP ON THE LIFESTYLES OF THE RICH AND FAMOUS. 10:23 AND PROCLAIM THE MESSAGE OF THE KINGDOM OF GOD, AND OH WHAT A MESSAGE IT WAS! 10:35 ...HOW CAN I PUT THIS? 10:42 BUT THEN THIS "MASHIACH", THIS MESSIAH WILL RAISE UP INDIVIDUALS FROM THOSE RUINS. 10:47 WHAT A GREAT STORY! 10:51 HAVING LOOKED AT ISAIAH AND HIS PROMISES OF A NEW LIFE THAT'S AVAILABLE TO WOMEN AND MEN. 10:58 WHAT I WANT TO DO IS PRACTICALLY SEE HOW THAT'S FLESHED OUT IN THE TEACHING OF JESUS. 11:09 "HEY, HOW CAN WE GET A HOLD OF SOME OF THAT KINGDOM POWER?" 11:18 "HOW CAN I TAP INTO THE RESOURCE BASE THAT'S AVAILABLE IN HEAVEN"
11:21 "TO GET SOME HELP WITH SOME VEXING EARTHLY SITUATIONS?" 11:40 WE'RE ALL GRAFTED INTO A FAMILY AND I'LL GET TO THAT IN A MOMENT. 11:43 WHEN MY KIDS COME TO ME I WANT TO DO THE BEST I CAN FOR THEM. 12:12 IT'S INCUMBENT UPON JEWISH PEOPLE TO MAKE GOD'S NAME LOOK GOOD UPON THE EARTH. 12:21 THAT IT'S INCUMBENT UPON THOSE OF THE COVENANT TO MAKE GOD'S NAME LOOK GOOD. 12:26 IN FACT, ISRAEL BEARS GOD'S NAME. 12:28 THE SUFFIX "EL" MEANS GOD AND THOSE THAT CARRY THE NAME SHOULD CARRY IT WELL. 12:49 "THOSE OF US THAT LOVE OUR LIFE WILL LOSE IT. BUT THOSE THAT LOSE IT WILL FIND IT." 13:01 BE COMMITTED TO GOD WITH OUR TIME, ENERGIES, RESOURCES, AND BE COMMITTED TO OTHER PEOPLE. 13:07 WE'RE SO MUCH OUT FOR OURSELVES. 13:10 WIRED LIKE THAT, WE MISS THE KINGDOM PRINCIPLE THAT IF WE LOVE OUR LIFE WE'LL LOSE IT. 13:27 TO HELP US GET FURTHER ON DOWN THE ROAD IN LIFE. 13:30 T'S JUST SO VERY CONTRARY TO NATURE BECAUSE HUMAN NATURE TENDS JUST TO BE OUT FOR ITSELF. 13:39 THE NATURE,THAT NEW BIRTH, THAT COMES FROM GOD, THE HOLY SPIRIT. 13:45 INSTEAD OF OUR OWN BASE IMPULSES WE'D BE THE BETTER FOR IT. 14:07 REMEMBER THE CHILDREN OF ISRAEL WERE ENSLAVED IN "MITZRAYIM", IN EGYPT. 14:11 THEN GOD DELIVERED THEM FROM EGYPT, BUT IT TOOK YEARS TO ACTUALLY GET TO THE LAND OF ISRAEL. 14:22 AND WHAT DID GOD DO? 14:23 HE PROVIDED FOR THEM MIRACULOUSLY. 14:25 AND SOMETIMES WE'RE AT A PLACE WE NEED GOD'S MIRACULOUS PROVISION. 14:32 PRAY THAT GOD WILL GIVE US OUR DAILY BREAD AND THAT HARKS BACK TO THE MANNA. 14:52 A LOT OF US GO THROUGH LIFE, WE DON'T FORGIVE OTHER PEOPLE. 14:55 WE'RE ANGRY AT THEM.WE'VE BEEN DISAPPOINTED BY SOME PEOPLE, BETRAYED, ABANDONED. 15:02 WHAT HAPPENS IS WE JUST GIVE UP ON PEOPLE AND GO THROUGH LIFE ANGRY. 15:10 THERE CAN BE THIS SLOW, SIMMERING ANGST BECAUSE WE'RE JUST ANGRY AT THE WORLD. 15:16 WELL WHAT DO YOU DO WITH THIS? 15:20 "FORGIVES US OUR TRESPASSES AS WE FORGIVE THOSE WHO TRESPASS AGAINST US." 15:27 YOU'VE GOT TO HEAR ME ON THIS; YOU'VE GOT TO BE THIS WAY. 15:44 "LORD, LISTEN, I'M ASKING YOU GOD...MY PERFORMANCE HASN'T BEEN QUITE PERFECT"
15:48 "AND I'M SAYING LORD I WANT TO OWN UP TO IT, CONFESS IT LORD,"
15:52 "I WANT YOU TO FORGIVE ME FOR THAT." 15:57 AND WE SHOULD EXPECT HIM TO FORGIVE US BECAUSE HE PROMISES THAT HE WILL. 16:05 THAT SHOULD BE OUR RELATIONSHIP TOWARD OTHER PEOPLE AS WELL. 16:08 NOW HEAR THAT PRINCIPLE IF YOU FORGET ANYTHING ELSE THAT I'VE TOLD YOU...I'VE...TOLD YOU. 16:12 WELL I HOPE THAT YOU'LL CONSTRUE THAT THIS IS THE BIBLE TALKING TO YOU NOT ME. 16:15 I'M JUST THE MESSENGER. 16:25 HE'S GOING TO BUILD RUINS, HE'S GOING TO REBUILD LIVES. 16:29 AND I'M PRACTICALLY HERE JUST LOOKING AT SOME TEXT THAT TELLS HOW HE'S GOING TO DO THAT. 16:35 AND "PRESTO" AND ALL THE SPARKLIES COME DOWN AND WE HAVE A PERFECT LIFE. 16:42 WE'RE TOLD THAT HIS DIVINE POWER HAS GRANTED US ALL THINGS THAT PERTAIN TO LIFE AND GODLINESS. 16:48 WE'RE TOLD THAT WE HAVE THE SEED THAT'S PLANTED WITHIN US, THE KINGDOM OF GOD. 16:51 BUT LIKE ANY SEED IT'S GOT TO BE WATERED.AND IF WE WATER IT, IT GROWS. 16:55 THIS IS SEED WATER RIGHT HERE. 16:58 HEY, I HOPE YOU'VE HEARD FROM ISAIAH AND I HOPE YOU'VE HEARD FROM JESUS. 17:02 IT'S GOOD NEWS INDEED ISN'T IT, THAT HE RAISES UP THE FORMER DEVASTATIONS? 18:02 THAT'S ISRAEL AND THAT'S THE WAY WE SEE IT. 18:04 WE SEE THESE RUINS ON THE TOUR. THEY ARE WONDERFUL VISUALS FOR US JEFF. 18:09 OUT OF THOSE RUINS COMES OUR SALVATION. 18:12 IT'S TRUE. THEY TELL THE STORY OF BIBLE, EVENTS IN DAYS PAST. 18:17 BUT LOOK AT THE REGENERATION OF ISRAEL. 18:23 AND IT'S WONDERFUL TO SEE. 18:29 AND HE PROMISES TO BE WITH THE PEOPLE. 18:32 THOUGH THEY FALL, THEY RISE AGAIN. 18:34 THAT'S RIGHT, AND ISN'T THAT ENCOURAGING FOR ALL OF US? 18:36 I BELIEVE THAT IT IS. 18:41 AND WE'RE GOING TO HEAR FROM OUR BELOVED FRIEND ZOLA LEVITT WHO INTERVIEWED HIM. 18:45 I THINK IT'S AMAZING PERSONALLY, ZOLA WAS ABLE TO GET IN FRONT OF A LOT OF PEOPLE. 18:56 TELL THE STORY OF ISRAEL'S COMING BACK TO LIFE IN THE MODERN WORLD. 19:17 AND THAT REGENERATION COMES ABOUT BECAUSE OF IMMIGRATION THAT COMES TO ISRAEL. 19:26 AND FROM ETHIOPIA IN LESS THAN TEN YEARS. 19:29 IN OTHER WORDS, TEN, TWELVE YEARS AGO, WE WERE 4 MILLION JEWS IN THIS COUNTRY. 19:34 NOW WE'RE OVER 5.4 MILLION AND ALL TOGETHER 6.5 MILLION PEOPLE LIVE IN THIS STATE. 19:43 "WELL YOU KNOW ISRAEL IS FALLING APART AT THE SEAMS, ISRAEL HAS NO FUTURE,"
19:54 I JUST DRAW YOU TO THE STATISTICS. 20:00 AND IN THE 30'S THERE WERE ONLY 400,000 LIVING HERE. 20:08 A VIBRANT ECONOMY, PEOPLE WHO ARE LEADING TODAY IN THE HIGH TECH INDUSTRY, IN MEDICINE. 20:23 BECAUSE WE OBSERVED PEOPLE COMING FROM 102 COUNTRIES SPEAKING 82 DIFFERENT LANGUAGES. 20:32 WHAT LANGUAGE COULD THEY SPEAK? 20:41 COMING FROM ALL DIFFERENT PLACES AROUND THE WORLD. 24:20 JEFF, I LOVE YOUR TEACHING ON THE LORD'S PRAYER. 24:24 AND YOU BREAK IT DOWN INTO HEBREW. 24:34 REALLY DOES MOVE MY HEART. 24:36 YES, AND THE LORD'S PRAYER IS MUSIC INDEED. 24:39 IT'S MUSIC TO THE SOUL. 24:44 HOW THE LORD IS WORKING IN ISRAEL, ITS REBOUNDING AS A NATION STATE. 24:56 AND I'M MINDFUL OF THE TRANSFORMATION THAT'S AVAILABLE. 25:02 "AND HOW IS IT SOMEONE GETS THAT TRANSFORMATION?" 25:07 AMEN. ASK, SEEK, KNOCK. ASK. 25:12 IT IS SO IMPORTANT THAT INDIVIDUALS DO THAT. 25:14 THIS IS A MINISTRY IT'S NOT JUST FOX NEWS. 25:17 WE'RE GLAD TO TEACH YOU THE NEWS FROM A BIBLICAL PERSPECTIVE BUT WE WANT GOOD NEWS IN YOU. 25:21 IN MATTHEW CHAPTER 7 THE LORD SAYS, "ASK" AS SANDRA REMINDED US. 25:27 "ASK AND YOU WILL RECEIVE, SEEK AND YOU WILL FIND, KNOCK AND IT WILL BE OPEN TO YOU." 25:42 WHY NOT DO THAT TODAY?ISN'T THAT THE MOST IMPORTANT DECISION ANYONE CAN MAKE? 25:47 WE SAY TIME IS SHORT. WE'RE NOT KIDDING. 25:50 I ALWAYS SAY THE LINE WILL BE DRAWN IN THE SAND. 25:55 "THAT'S IT. MAKE A CHOICE"
25:57 "OR I'LL MAKE IT FOR YOU." 26:07 THIS IS THE DAY. 26:18 AND GIVE YOU SOME OF THAT RESTORATION DESCRIBED IN THE TEXT. 26:25 AND THAT'S REALLY THE GOOD NEWS. 26:31 PRAY FOR THE PEACE OF JERUSALEM.